So I was digging through my hard drive yesterday and I found a number of txt files. Intrigued, I --- ah never mind. Here are a number of tutorials collected throughout my years here. The majority are my posts, with a few exceptions that have credit clearly labelled. I want to see if I can make this a comprehensive help thread; feel free to post additional tutorials as replies and I will edit them into the main post. Before you can understand what an allegiance does, you must learn what a team is. The team of an unit or an AI encounter is the team that the unit / encounter is affiliated with. For example, the player is always on team 1: player, and it is common practice to set marines to team 2: human and covenant to team 3: covenant. Note that this is for single player only; in multiplayer, red team is team 0 and blue team is team 1. This will create a bond between the player and human teams, with both cooperating as per the campaign. It will also inherit the trait in that if the player betrays the human teams (teamkilling marines as I'm sure many of you have done :V), the allegiance will break, and the marines will become the player's enemies (I'm sure you've also witnessed this). This will effectively break the bond between the two teams. a) Before I proceed, I'll explain what I mean by "groups". Each group is an area where the AI would fight in given the player's proximity. For instance, if you have a series of rooms, and you make each room have a separate group of firing positions, the AI would fight in each room. Let's say the player's in room 1. Thus, the AI would only use the firing positions within room 1. When the player moves to room 2, the AI will use the firing positions in room 2. If you don't understand this, that's not too much of a problem. Just put firing positions down in groups. How? b) To put firing positions down in groups, in the properties pane, there will be a dropdown box to specify a certain letter. Each letter represents a certain group. If you place half the firing positions down with A (red), and half with B (blue), then they'll choose between groups whenever convenient. Remember to keep the A firing positions grouped together, and the B firing positions in a separate group. 2) Create one squad (only one). Specify the actor variant, the difficulty, etc. Check automatic migration. 3) Create a new squad. For this squad, do NOT specify the actor variant or difficulty. Instead, the only things you do are to check automatic migration and follow the directions below. 5) Repeat for all firing position groups. 6) Use the ai_follow_target_players command in a script. Place firing positions in the general area you wish the AI to go to. Add some firing positions around the path to that area. In each AI squad, set the initial and return states to "guarding at guard position"
If you don't know how to create a script, just copy what I typed into a new Notepad file. Replace redteam and blueteam with the names of the AI encounters you want to fight. Then, click File > Save As (in notepad), and set the dropdown box to "All files". Save the file as script.hsc. Then, move the script.hsc file into the reciprocal of the tags folder, in the data folder. For example, if your scenario is located inside tags\levels\test\death_island\warisland.scenario, then put your script.hsc file inside: data\levels\test\death_island\scripts\script.hsc. The scripts folder will not initially be there; you must create it yourself. Once in, in Sapien, go to File > Compile scripts (or something like that). Alternatively, you can use the keyboard shortcut ctrl + shift + c.
Sapien should then display scripts compiled successfully. Save the scenario, and compile it in tool. File > New > Actor Variant. Actor Definition: Direct this to the .actor tag that you wish to use. The .actor tag contributes a lot towards the way the AI acts. For example, the maximum distance that the AI can see is specified in the .actor tag, as well as guarding parameters, duck behind cover chance, etc. Unit: Set the type of unit. Don't forget to browse to the unit itself. This is the biped that you will use. Major Variant: This is the actor variant that contains the major variant. For example, in grunt minors, the grunt major variant is specified here. Movement Switching: Essentially specifies whether the AI just runs, or crouches and runs. Weapon: The weapon that the AI uses. Self explanatory. Maximum Firing Distance: The maximum distance that the AI can shoot at. For assault rifles, I average around 8. For battle rifles and marksman rifles, I use around 16. For sniper rifles, I go for 40 or so. Rate of fire: How fast you want the weapon to fire. If you want the AI to fire fully automatic, leave it at 0. If you want to fire semi-auto, one round every 2 seconds, you'll do a little math. One round every 2 seconds is 0.5 rounds per second, so you would use 0.5 here. Projectile Error: How accurate you want the AI to be. Gonna skip the next three because I never touch them. You can copy the values from another AI. Death Fire Wildly Chance: The chance of firing randomly when the actor dies. Death Fire Wildly Time: The time you spend firing wildly after you die. Firing wildly isn't necessary, but it's a nice touch for flood and grunts when they die. More of an aesthetic feel than one of a gameplay changing feel. Desired Combat Range: This is a biggy. This sets how close the AI goes towards its target to fire. For sniper rifle AI, you want to stay far away. The end value also should be less than the maximum firing distance, so that it doesn't try to stay further away than it can. So for a sniper rifle AI, I'd normally leave it to pretty long ranged; around 30 - 40. For assault rifle AI, I keep it tight; 5 - 8. For shotgun AI, they're most effective at close range, so you'd leave it at 2 - 5. Note that the AI will TRY to get within this range, but if the maximum firing distance is greater than the end, it will fire at you if it isn't capable of entering this range. The next two are aesthetic modifiers, to set the gun offset. I'm not going to dabble into this. Target Tracking: On a scale of 0 to 1, it sets how well the AI tracks its target. Target Leading: On a scale of 0 to 1, it sets how well the AI leads its target. Please don't set target tracking and target leading to 1, and be like "z0mg mai AI r so l33t cuz they r raep teh enemiz 10/10 tiemz". Weapon Damage Modifier: Sets how effective the damage is with the certain weapon when the AI is using it. For example, if you have a rocket launcher AI, and you set the thing to 0.01, it'd only do 0.001 of the damage of a rocket launcher, which is around 300. So, you'd only take 3 damage from a direct hit, instead of 300. Damage per second: Leave it at 0 to use the weapon's default. This is basically how much damage the AI does with the weapon towards its target per second. For most of Burst Geometry, I'm only going to cover the important parts. Not enough time to go indepth. Burst Duration: How long each burst lasts. So if you have a machine gunner AI, who fires for ten seconds at a time, set it to 10. If you have a pistol crewman, who fires one shot every few seconds, set it to that fraction of time. Burst Separation: How long the AI waits between each burst. Special Damage Modifier: A damage modifier for the special case firing. We'll go into this later. Firing Patterns should be self explanatory. Overall, it just modifies your firing length and speed when berserking, moving, and acquiring a new target. Special Case Firing Properties: This is a biggy. Overcharge: This is for weapons that are capable of charging (Plasma Pistol, Spartan Laser). Secondary Trigger: This is for weapons with a secondary trigger (Assault Rifle with Grenade Launcher, Battle Rifle with Masterkey Shotgun). Strafing: When the enemy is in sight, and moving back and forth. Like those noobs in bloodgulch. Special Fire Chance: The chance of using the special fire property. Special Fire Delay: How long you must wait before using the special fire again. Berserking and Meleeing should be self explanatory. Berserking is basically when the AI goes crazy, like when elites pause firing to roar at you. Grenades: Most of the grenade parameters are self explanatory. I'll cover the important ones. Grenade Velocity: This number must be a positive whole number in order to get the AI to throw. When you extract an actor variant, this normally isn't a positive whole number. You'd use around 9 to 10 for marines and grunts, and around 12 for elites. Collateral Damage Radius: The AI won't throw the grenade if there's a friendly unit within this distance of the planned grenade throw. Grenade Chance: How likely the AI are to throw grenades. Grenade Check Time: How often the AI check whether or not to throw grenades. Encounter Grenade Timeout: How often the AI must wait between grenade throws. This goes for all actors in an encounter. So if (list_get (ai_actors encounter) 0) throws a grenade, (list_get (ai_actors encounter) 1) cannot throw a grenade until the timer has gone up. Items: Basically the stuff the AI drops when he dies. Equipment: Not necessary, leave blank if you don't want him to drop anything. Otherwise, specify the equipment that you wish the AI to drop (health packs, overshields). Grenade Count: Number of grenades that the AI drops when he dies. Don't drop grenades chance: How likely the AI is to NOT drop a grenade when he dies. Drop weapon loaded: Fraction of the ammo loaded into the weapon that the AI drops. So if you had 0.2 - 0.4 for a MA5B Assault Rifle, which has a clip of 60, he'd drop the weapon with 12 - 24 rounds loaded. Drop weapon ammo: This is the amount of ammo stored in the weapon. This doesn't use a fraction system; rather, it uses an actual ammo count. The last few values should be self explanatory / unnecessary. Change Colors: This is for variants with color changes. If you set it to pink, for example, for a spartan AI using the multiplayer spartan biped, the AI would be pink. You have a model_animations file, but the file itself is missing cases for each weapon. It's an easy tweak. If you installed it elsewhere, I'm sure you know how to do this part. Replace levels\test\tutorial\tutorial with the directory of your .scenario file. If it's in tags\levels\test\tutorial\tutorial.scenario, then you would type what I posted above. Otherwise, it'll be the location of your scenario minus the .scenario and the tags\ folder. Tool will take a bit of time and spit out a bit of output. Wait for it to either display ###FAILED TO WRITE DATA CACHE FILE or successfully compiled cache file (both are self explanatory). 6) Open a command prompt and use the tool command for bitmaps. 7) The bitmap will be outputted. If you overwrote the original, then just compile a map or look at your bitmap in sapien. The string is the name of the animation you want to play. If you don't know the name, open the model_animations in Guerilla and browse through all the animations in the model_animations. For the marine wave animation, it's: "stand_unarmed_act-wave" (or stand_unarmed_act-wave2, could be either). For the boolean, set this parameter to true if you wish to fluidly interpolate into an already playing animation. Set this to false if you want the unit to stop everything he / she / it is doing and play the animation. 1. Place a vehicle (warthog works best) in in Sapien in a in-accessible location (preferably a "sync" room). Name it "host_hog". Make sure the vehicle is set NOT to spawn automatically on any gametypes. 2. Make a trigger volume that just barley fits around the vehicle. Name it "host_vol". 3. Make a cutscene camera flag in the room. Name it "host_cam". 1. In your "Vehicles" list in Sapien, place a vehicle spawn point in a location where no player can go. Set the spawn point's vehicle type to "NONE" so no vehicle actually spawns there. This spawn point has to be the very first in the list of vehicles in Sapien. The reason for this is all vehicles that the game considers "extra" are respawned to the first vehicle spawn point, no matter where their actual spawn points are. So we take advantage of that here. 2. Place a trigger volume (Game Data > Trigger Volumes) over this spawn point. Make sure the trigger volume is larger than the largest vehicle that you need a script to respawn. For example, if you have two scorpions, a hog, and a ghost, make the trigger volume at least as large as the scorpion. Name this trigger volume whatever you want. This will be used to check to see when the vehicle has respawned to the first spawn point, then re-create it that very same moment to bring it back to its true spawn point. 3. Also, place a new vehicle of any type (hog, ghost, anything. Preferably something small) in either the same area (away from the trigger volume) or in a different location that the player can't go to. Name this vehicle "host_check", and set it to spawn BY DEFAULT in all game types. Make sure it's a vehicle that is in the globals so it'll spawn by itself, otherwise this won't work. This is to check in the scripts to make sure the game doing all of this is the server. It works because the vehicles are server-side only, and so if you try to check for a vehicle's existence and you're not the server, it will say the vehicle doesn't exist, which lets us check and see who's the server. If we allowed the script to run without making sure only the server is making the changes, then there would be two vehicles spawned for each spawn point: one is the real server-side one, and the other is a client-side copy that doesn't exist on the server and so is just useless and annoying to players. 4. With all of the vehicles that you need scripted in, place them where you need them and set their properties as usual. Just remember to give each one a unique name for the scripts. ;; repeat each of these (if)'s for each vehicle. Use copy-pasting to do it faster. Just replace the things in "quotes" and compile, and then test. 3) For this tutorial, we'll only create one title. If you wish to use multiple cinematic titles throughout your map, just keep clicking add for each one. Type what you want to appear into the box where you can type text, and click add. Repeat for every title you wish to add. 5) Once saved, run Guerilla, and open your .scenario file. 6) Scroll to the very bottom. In the boxes above the BSP, look for an area to enter in "ingame help text"
7) In this box, browse to your string list that you created. 8) Once done, scroll up a bit. 9) Under the giant heading which says "Cutscene Titles", click "add"
a) For name, DON'T put the text for the cinematic title. Rather, use something short and easy to type; for example, txt1. 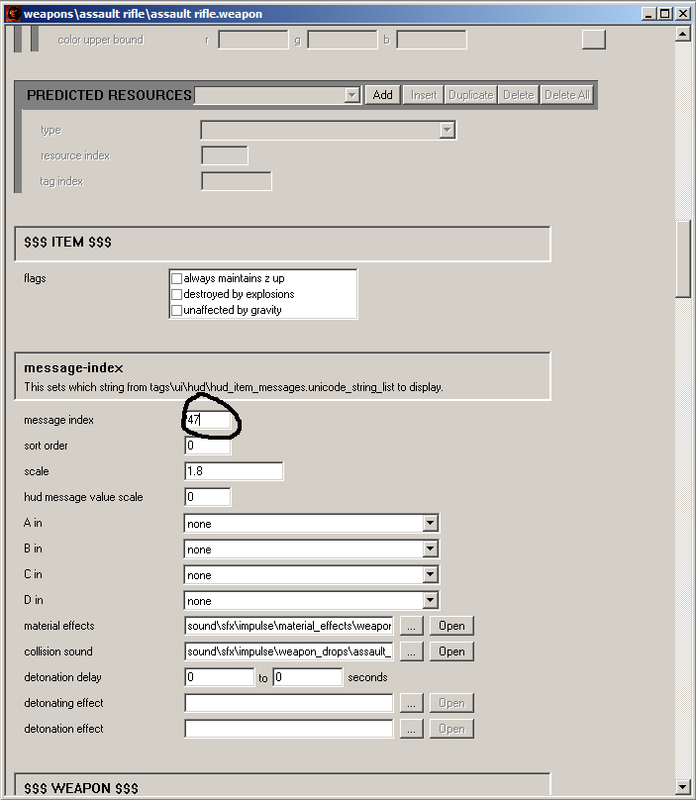 c) For string index, put the number corresponding to the text you want to appear. To figure out this number, go back to the string list editor. Next to every bit of text will be a number. For example, if you only have one title, that number will be 0. The second title in the string list will have the number 1. Enter this number into this box. d) For justification, put the corner in which you want the text to appear. Default is 'right'. i) Fade out time is how long you want to wait before the text fully disappears. Default is 1. 11) To repeat this for another, go back to the top and click add. Repeat the process for every string list. 12) This is the scripting part. NOTE: REMEMBER TO SAVE THE SCENARIO IN GUERILLA AND CLOSE IT BEFORE OPENING SAPIEN TO COMPILE THE SCRIPT. Please note that the name of the title is NOT the title itself. Rather, it's the name you entered back in step 10a. Add (cinematic_show_letterbox false) whenever you wish to disable the box. Please note that the name of the title would therefore be txt1. Compile the scripts, and you're done. Chapter titles use "unicode_string_list" tags for storing the text. Then, using the string list editor, make a new "unicode_string_list" tag with as many strings as you want. Each string will be one Chapter Title. Once you're done, save the tag anywhere, but preferably in the same folder as your scenario tag. Name it whatever you want. Next, in Guerilla, open up the scenario tag. Go all the way to the very bottom and you'll see "Cutscene Titles". Just under there should be a tag reference that says "ingame help text". Browse on that one, and select the tag you just saved. Then, just next to "Cutscene Titles", click the "Add" button to make as many chapter titles as you need. Just under should be "name". Make the names whatever you want, but make them easy to remember because that name is used in the script. That actually makes it come out to the left, oddly enough. Once that's done, set the "string index" to the index of the string you want to use for that chapter title. If you're not sure, you can get the number by opening the string list tag and looking at the number to the left of each string right in Guerilla. It starts from "0" and goes up. Then comes the text color. The "r, g, b" values are just 0-255 levels of red, green, and blue to make a color. You don't have to worry about that, just select the color by clicking the box to the right. Most likely you want white. Most of the time, the shadow is set to black, but it can be changed too. Don't miss the "a" before each color though, that's the alpha transparency. 0 = fully transparent, 255 = opaque. So most likely you want 255 for no transparency. Then, the fade times should be self-explanatory. "up time" is how long it stays fully opaque on screen once it fades in, "fade in" is how long it takes to fade in, and "fade out", same thing, but fading out. 1) Get a string list editor. 3) Scroll down to the giant header that says "Interface Bitmaps"
5) Find the box next to "item message text"
6) Open this string with the string list editor and edit to your heart's delight. 9) Scroll down to the title "message-index"
hud_messages are different from unicode_string_lists that the string list editor saves. These you're going to have to do manually in notepad and compile them with Tool. First off, in your notepad file, each line will be one hud message. Don't make them too long, as Halo does not clip the message to a new line in-game, and instead it runs off the screen. However, there is a way to make new lines if you really need that much text. It's shown later in the tutorial. You don't have to include the ">>" at the beginning, but it was used for most hud messages and it looks best to have it. obj_chasm2=>> Reach the transition to the |n third chasm. 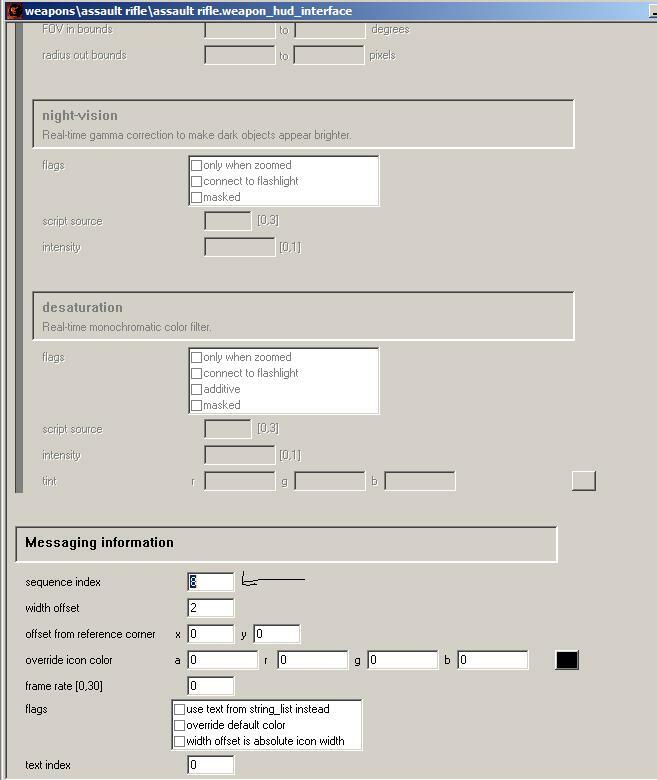 After you have all of the messages you need, save the file in the exact same directory as your scenario is located under the "tags" folder, but in your "data" folder, and you must save it as "hud messages.hmt" without quotes and change the "Encoding" to "Unicode", not the default "ANSI". You will know what I mean when you go to save with Notepad. Tool will not compile correctly unless you do all of these steps. For example, if your scenario is located in "tags\levels\amazingmap\amazingmap.scenario", then you either have to find "data\levels\amazingmap" or create that directory and then save it there, resulting in the file's path being "data\levels\amazingmap\hud messages.hmt". because the path to either the scenario or the messages file is the same: "levels\amazingmap" and the scenario name is of course "amazingmap". It then compiles your hud_messages tag into the tags folder where your scenario is and automatically gives a reference to it from your scenario so you don't have to do it yourself. Then, you're ready to refer to these messages in your script. "boolean" meaning you can enter "true" or "false", as in "yes" or "no", or you can enter "1" or "0", respectively. When this is turned on, the hud message selected will be constantly displayed, so you should turn it off again when you want it to disappear. This command does the same thing as the one above, except it sets the message to be displayed when you hit "Esc" and go to the pause menu under "Objectives". 4) Scroll to the bottom and click "Add"
11) Scroll down to the message-index header, and under message index, specify the index of the "Picked up a weapon" index entry (Here: http://i.imgur.com/FIphq.png; kudos to Dancing Mad for posting the picture). For "navpoint type", replace it with the type of navpoint you want. I don't really remember all of them; in fact, the only one you probably need is "default". That's the default blue arrow used throughout the campaign. For "team", this is the team that sees the nav point. Obviously, you want the player to see the nav point, and thus, you use "player". If this is a multiplayer map, teams are done differently, and the player team is blue team (afaik, iirc). I'll check tomorrow. The "object" is the object you wish to attach the nav point to. Just substitute it with the name of the object you want (this can be specified in the properties pane when you select the object in hierarchy view). The "vertical offset" is how high above the object you want the nav point to appear. If you're all out of ideas, 0.6 is a good number. "Team" and "object" are the same ones you used for the activate command. Now, you probably want to make these nav points appear once you go through a trigger volume, or when something happens. Basically, you'd use a "conditional" phrase before the activate / deactivate commands. A conditional phrase is basically a command that checks whether a condition is true or false. Slightly confusing, but for now, we won't go too far into it. Hit m to bring up the materials manager thing, and click the Standard button on the right, underneath the balls (insert pun here). Choose Multi/Sub-Object from the resulting list of materials, and choose "Discard old material" when prompted. Click the very first result, and next to the Standard button, there will be a text field. Type in the name for the shader, for example, letters. This'll be the name of the shader that'll be referenced in the .gbxmodel. If the shader exists in your tags folder, it will automatically be assigned. If no, a blank one will be created in the tags root folder upon tool's compilation. Then, create a small sphere, radius 1, and name it frame scenery. Put it in the center of the text. Click the link button in the toolbar or wherever it is, and link to the sphere. Then, use the JMS exporter to export it to a JMS (different process for Gmax). Once exported to a JMS, put it in the data folder, and create a subdirectory for the alphabet letters. Create a models folder in that folder. (Ex: C:\Program Files\Microsoft Games\Halo Custom Edition\data\scenery\alphabet\letters\models) Put the JMS inside this folder. Tool will take a moment to compile, and when it's complete, you'll have a new .gbxmodel in your tags folder (the reciprocal of the data folder). For example, if you placed the JMS in data\scenery\alphabet\letters\models, your new gbxmodel will be placed in tags\scenery\alphabet\letters. Open up Guerilla, and at the top, click File > New > Scenery. In the new .scenery file, under model, browse to your gbxmodel. Save. Now you're ready to use it for whatever purpose in your maps. Or, you can stack crates in Sapien to spell out words. Crude and ineffective, but that's an alternative. 6) Specify your spawn time. 10) Note: The weapons will not appear in game view. 4) In the dropdown list, there will be six vehicles. NOTE: YOU CANNOT HAVE MORE OR LESS THAN SIX TYPES OF VEHICLES HERE. 5) Replace an existing vehicle with the one you're trying to add. You MUST replace, as adding won't work. Then compile your map, and you're good to go. (script "script type" "script name"
You can replace script name with whatever you want, although if it has spaces, it must have quotations around it. For script type, either use a startup script for a script that begins as soon as the map is loaded, a dormant for a script that has to be woken (through the wake command), a continuous script that is continuously executed throughout the map, or a static void, essentially a script declaration that creates a new script command. For your script, just use a startup. Now, cut that entire block and paste it where I said to (). THIS IS NOT A STANDALONE SCRIPT. YOU CANNOT USE THIS ALONE. Reference the above tutorial on script headers. PLEASE NOTE THAT THIS ONLY SETS UP THE TIMER AND THE OBJECTIVE TEXT. THIS DOES NOT ADD IN AI OR WHATEVER ELSE YOU WANT. This tutorial will teach you how to make a basic firefight map, similar to the one seen in my b40_firefight. After having read this, you should be able to understand the scripts that I released for said map. - knowledge of how to get a script working/compiled in Sapien (creating a .hsc file). "levels\my_firefight\my_firefight_phantom", and the animation itself is called "top_anims". -top1_in: this animation was made to bring the dropship to a position above the battlefield. -top1_drop: this animation was made to bring down the dropship to a position low enough to deploy troops. -top1_wait: this animation was made to keep the phantom roughly in place, as the troops are deployed. -top1_out: this animation was made to get the phantom out of the battlefield. - These squads will be used to let the ai follow the player around. - Define the amount of ai you want the dropship to drop off in the squad named "droppers". - Place starting points anywhere where the player won't be able to see them. - Make sure that "automatic migration" is checked for squad b and squad c.
- place firing positions A wherever you want the droppers to attack initially. Also make sure your map is set up as single player, and that you have a starting position for the player. Make sure all "game modes" things for the starting position are set to "none". Now that the stuff in Sapien is set up, it's time for the scripting. Don't be afraid, it's not that hard. We're going to set up the scripts so that we have the dropship come in again everytime the actors inside the dropship die at the hands of the player. First we shall define a static script that will take care of all the animations of the dropship. A static script, when called, will execute everything within it. We can reference a static script as much as we want further in the .hsc file! ;;;This static script is responsible for executing the custom animations of the dropship, and unloading any ai in the dropship. Nothing more. This script is pretty straight-forward. When called it will execute all the animations we made for the dropship. Take special notice to the "vehicle_unload" command. One would reference this static script by typing: "(dropship1CustomAnims)". With a static script defined to play our animations, we now need a script that will control when the dropship animations should be played. We'll use a continuous script to achieve this goal. Remember that we want the dropship to come in whenever the ai from the previous dropship has died. (global boolean startDropshipTop1 false);This boolean will tell us when the custom animations for top1 can be played. ;;;This script is responsible for controlling wether or not the custom animations of the dropship should be called upon. ;;;This static script defines exactly what should happen within one round of firefight excitement. Notice the comments I placed. You should see the connection between The lines that have "LINK ME" and "LINK ME AS WELL" as a comment. This should further explain how the above scripts work together. Alright, now you should be able to create a basic firefight map with a dropship! You can, of course, further enhance the script and scenario to allow for a more exciting setup. Be creative! You've reached the bottom of this enormous post! HOLY COW this is going to take forever to read through. Best start now.. I should probably create a table of contents and an easy way to ctrl + f what you want to find. I'll do that one of these days when I don't have so much work. Wow, that's the most useful wall of text ever. or just copy to pdf. This is freakin awesome. Finally a HUD message tutorial. Anyway to convince Dennis to sticky this? I sent a PM, but it's ultimately his decision. I can understand if he doesn't want to. If anyone has any tutorials to add or requests for tutorials, please post! I'll be sure to add them to the first post. I'll also work on making it easier to find a specific tutorial. I made a firefight tutorial, might fit in with the whole AI/scripting theme. Although it's a bit more specific than these "basic" ones. That's fine. It's best not to discriminate by difficulty :D I'm guessing it's the one you posted on Halomaps; I'll add that into the first post after I finish this post. There, just fixed it. Thanks for the heads-up! If anyone else has any tutorials they want to add or have any tutorials they wish to request, feel free to post and I'll see if I can get that in soon. make it a pdf or even a txt file and upload it. I'll do that, but I was kinda hoping that this thread could be a sort of wiki where people could continue to add tutorials and request tutorials. That way, all the assorted modding knowledge can be gathered in one easy to find place. I guess things aren't going to go this way though, so I'll upload it as a PDF. Gamma, can you please add these all as new pages to our wiki at HaloDemoMods.com? Or if you don't want to do that, I would like to add them there myself, if you let me. Thanks. I don't have the time to add them, but you can feel free to add them if you want! When i saw Tutorial, and as author Gamma. I already knew then it would be some awesome awesome tutorials. could you make fp animation tutorial, please? it won't need to be long. There are already plenty of fp animation tutorials on the website. You can't simply explain fp animation with words. As XlzQwerty1 said, I can't really teach animation with a text tutorial. It's more of an art than anything else and there are several video tutorials on Halomaps that explain this. This is what I used to learn. It also covers exporting the animation. Just a quick tip though: ignore what the tutorial says about linking. I could make my own video tutorial one of these days, but I've been really busy lately / infected with senioritis, and I don't know when I can do it. If you want a text tutorial on exporting animations or on link constraints, I could create one, but it'd be more difficult to follow than a video tutorial. Bump. Also wondering if someone could tell me how to create the VISR effect used in CMT's SPv3 Truth and Reconciliation map. Search is your best friend on the internet. whenever i type in (show_hud_help_text boolean true) or (show_hud_help_text boolean false) when i try to compile the scripts it just closes any idea why? This is insanely useful and very easy to follow. Thank you so much. Yo Gamma when can we expect an update?